Humana has voluntarily certificate dated April 5, 2016 for NGO Benchmarking independent consultant SGS-Societe Generale de Surveillance. 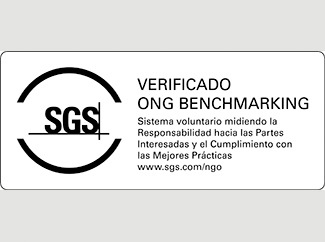 This certificate accredits our organization on compliance with good practices paras NGOs. -Best practice dimensions: board, strategic framework; integrity management; communication, promotion, public image, human resources, revenue, allocation of funds, financial controls; operations; results, continuous improvement. -Donor expectations: transparency, efficiency and effectiveness. administrative components: systems, activities (programs and projects), human resources and finance. -Continuous improvement: plan, do, check and act. It is a voluntary system that measures the responsibility to stakeholders and compliance with best practices. Today, Humana and the Red Cross are the only two Spanish entities who hold this certificate.